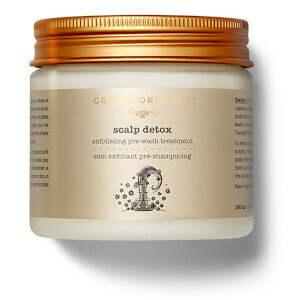 Treat your locks to The Intense Hair Detox from Grow Gorgeous. Combining four advanced formulas, the haircare collection works to combat lack-lustre, lifeless and thin hair for a denser appearance and radiant shine. 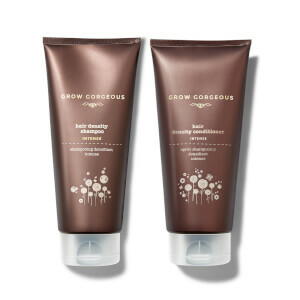 Utilizing plant-based actives and nourishing ingredients, the unique, cooling formula combines natural Castor Oil Beads, White Willow Bark Extract and Pomegranate Fruit Enzymes to gently exfoliate the scalp, providing a deep, intensive clean that eliminates clogging impurities, product build-up, dry skin and dandruff to create the ideal environment for hair growth. Suitable for weekly use, the pre-wash treatment leaves the scalp feeling rigorously purified and fresh, with enhanced stimulation to promote lustrous, revitalized hair. Its ultra-concentrated formula is infused with Amino Acids, Biotin, Caffeine and B-Vitamins to visibly increase density of hair, whilst advanced technology supports the follicles to promote healthy-looking locks. Delivering gentle, yet effective cleansing to prevent damage to hair, the shampoo is ideal for slow-growing and thinning hair, or for weak fibers in need of strengthening and repair. Suitable for all hair types, including color-treated, you can expect denser, fuller-looking locks with enhanced definition. An advanced formula that works to encourage enviably thick locks. Ideal for fine hair types, the conditioner aims to combat thinning and works on all hair types, including color-treated. Effortlessly gliding onto damp locks, the silky conditioning formula is enriched with an innovative form of Hyaluronic Acid, which is blended with Amino Acids, Biotin and B-Vitamins in order to address thinning hair and leave tresses soft, smooth and flake-free. Developed with a 40% concentration of seven technologies, the serum contains Glycine and Zinc to improve hair length for a fuller appearance, whilst a unique form of water-compatible Caffeine absorbs into the scalp to help reduce hair loss in a small time period. Enriched with Hyaluronic Acid to penetrate the scalp and enhance hydration so you can experience luscious, voluminous locks. Scalp Detox: Use 1-2 times a week as a pre-wash treatment, before cleansing hair. Wet hair and scoop a generous amount from the jar, rubbing it between your hands. Use your finger tips to massage the product all over the scalp in circular motions. Conditioner: Apply a generous amount to wet hair after using shampoo. Massage into the scalp and smooth through to hair ends. Leave on for 1 minute. Rinse thoroughly and style as usual. Serum: Apply once daily to the scalp either in the morning or in the evening. Massage evenly and thoroughly into the scalp until you feel the serum has been absorbed. Do not apply to eyelashes or eyebrows.